base of neck/shoulder to end of body at tail. Dog MUST be standing up straight to obtain correct measurements. Please check your dog's measurements. Male dogs are usually larger than female dogs. Custom Size (Surcharge applies) For those with small narrow necks (e.g. Whippets) or VERY large dogs. 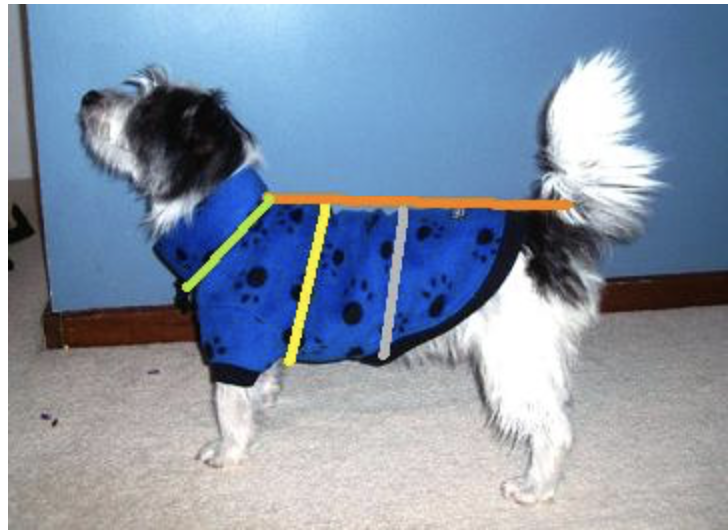 BACK LENGTH: Measured from base of neck (where neck meets shoulder bones) to end of body at tail (to length required) For dogs with upright tails the back length should accommodate the upright tail. AROUND CHEST: Measure around the largest part of the chest (usually 5-10cm from front leg). Allow for coat regrowth on breeds which are regularly clipped. AROUND TUMMY: Measured halfway along back length. This will be the measurement of the tummy strap. AROUND LOW NECK: This is measurement of coat neckline. This is NOT the collar measurement. On small breeds the collar will be slightly higher, but do not confuse the two measurements. FRONT SLEEVE LENGTH: Custom orders for Dachshunds or other short legged breeds, indicate length required for front sleeve.